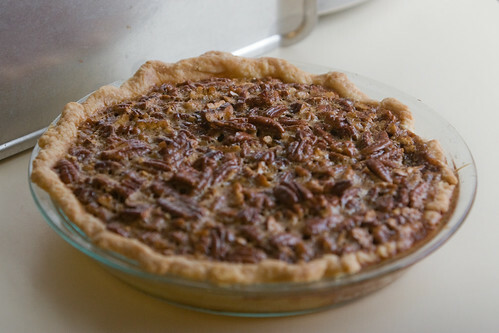 Pecan Pie, originally uploaded by Lindsay Beyerstein. I mixed and matched this year. The crust is from Dorie Greenspan's "Baking from My Home to Yours" and the filling is from Cook's Illustrated. The crust is my new favorite pie dough recipe. It's so flaky it literally puffs when you bake it. The pecan filling was a little too sweet for my taste, but otherwise good. "If you get a choice between regular heaven and pie heaven, pick pie heaven. It might be a trick, but if not, mmmm boy!" --Jack Handey. They just had a big pie dustup over at pharyngula. I guess pumpkin, pecan, and rhubarb are highly controversial pies, apparently. Why don't you make your own pastry and fillings? Just asking. I do make my own pastry and fillings. Are you asking why don't I write my own recipes? With baking, it's a lot easier to start with a well-tested recipe from a reputable cookbook or magazine. I usually follow the recipe as closely as possible the first time and then use that as a basis for later experimentation. As for the pie being too sweet, it goes the better with bitter coffee. Not really fond of pecan pie filling so we made a pumpkin pecan pie a la Paul Prudhomme (no Whiskey Butter Sauce, unfortunately, but still) Excellent!